Here’s an article published on March 23, 2012 on Hidden Track who hooked me up with a conference call with Bob Weir and the Devendorf brothers from The National! 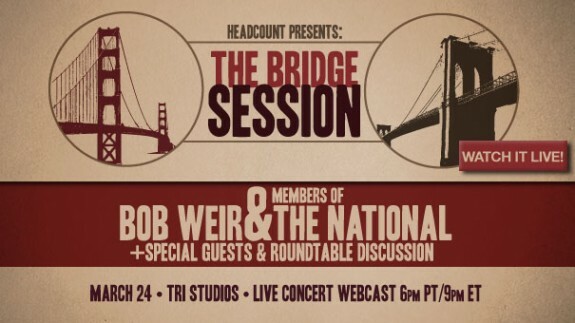 Tomorrow night, March 24, at 9PM ET/6PM PT, Bob Weir’s state of the art TRI Studios facility will host a free live webcast called The Bridge Session. For this two-set webcast, which will be broadcast on Yahoo! Music and through TRIStudios.com, Weir has invited some unexpected, but talented guests: the Devendorf brothers from indie band The National and some of their good friends from Brooklyn – bandmate Aaron Dessner, Thomas Bartlett, Kyle Resnick, Walt Martin of The Walkmen, Conrad Doucette of Takka Takka and Sam Cohen and Josh Kaufman of Yellowbirds. The Bridge Session is a musical event and roundtable discussion aiming to raise awareness about the American political environment and to garner interest for the sponsoring organization, HeadCount. It also brings together musicians from two different genres, and while this isn’t the most conventional band lineup, it’s for a cause that everyone involved works hard to support – political activism among young people, especially live music fans. “A lot of my passion these days comes from that I have a couple of kids and I don’t think that an older electorate is going to necessarily vote my kids’ interests, like younger people would,” Weir told Hidden Track. “I want to get younger people involved because that’s the future; I want to see them take hold of that so that my kids will benefit. Also, just world-view wise, I always have tended to side with a younger outlook politically; I’ve always voted, since I was able to. I didn’t get turned onto it, I was just motivated and I want the people of this generation to feel the same way,” Weird continued. HeadCount co-founder Marc Brownstein of the Disco Biscuits will MC the show, and not only will audience members be treated to Grateful Dead and National songs as well as classic covers with a political edge, they will also hear a special roundtable discussion which will be open to questions and comments from audience members during the set break. Panelists will include independent Presidential candidate Buddy Roemer, Mark McKinnon (a former media advisor to George W. Bush, John McCain, Bono and Lance Armstrong), climate change activist Jessy Tolkan and Grateful Dead lyricist John Perry Barlow. These panel members are from wide ranging political perspectives and will provide not only intellectual stimulation, but entertainment in an area usually taken too seriously. Audience members can submit their questions and comments via Twitter by tweeting to @TRI_studios using the hash tag #bridgesessions.